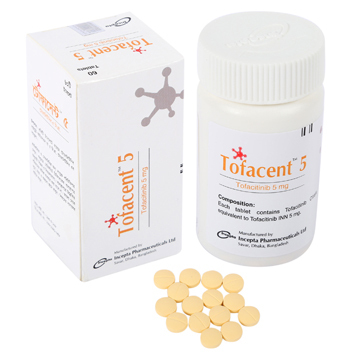 Tofacitinib is an inhibitor of Janus kinases (JAKs) indicated for the treatment of adult patients with moderately to severely active rheumatoid arthritis who have had an inadequate response or intolerance to Methotrexate. It may be used as monotherapy or in combination with Methotrexate or other nonbiologic disease-modifying antirheumatic drugs (DMARDs). The most commonly reported adverse reactions during the first 3 months in controlled clinical trials (occurring in greater than or equal to 2% of patients treated with Tofacitinib monotherapy or in combination with DMARDs) were upper respiratory tract infections, headache, diarrhea and nasopharyngitis. There are no adequate and well-controlled studies in pregnant women. Tofacitinib should be used during pregnancy only if the potential benefit justifies the potential risk to the fetus. The safety and effectiveness of Tofacitinib in pediatric patients have not been established. The frequency of serious infection among Tofacitinib-treated subjects 65 years of age and older was higher than among those under the age of 65. As there is a higher incidence of infections in the elderly population in general, caution should be used when treating the elderly.